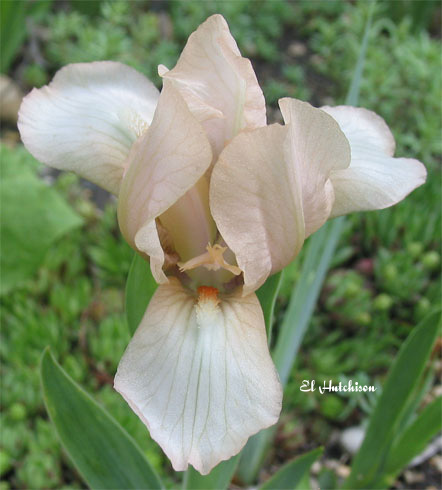 'Petite Blush' (Jack Boushay, R. 1989). Seedling #74-W-03. MDB, 6" (15 cm). Midseason to very late bloom. Standards venetian pink (Wilson 420/2); falls white, venetian pink hafts and edge; white beard. Seedling #M-1704-5: (('Pink Cushion' x 'Lenna M') x sibling) X 'Cherub Tears'. J. & J. Iris 1989.